At the end of the week, we are all exhausted from the long work/school days, football games and activities that you or your children attend. Sunday is meant for relaxation and repair for the body. Read a few chapters in a book you have been dying to read, take a soothing bubble bath, bake some of my recipes for your family, exercise, or even do yoga meditations outside! It’s beginning to feel like fall! Take some time for your body to recover from all of the stress, and fill it with good foods and energy to nourish our bodies! You are worth having a healthy body! Posted on September 28, 2015 Leave a comment on You Are Worth It! Fall is officially here! Instead of going through Starbucks for a pumpkin spiced latte, you can make your own using raw, healthy and body loving ingredients! I promised that I would post my “bulletproof” pumpkin spiced latte recipe when fall arrived, so here you go! Blend all of the ingredients in a blender for 30-60 seconds, this makes the drink really frothy like a latte! If it needs heating, just pop it in the microwave for 30-60 seconds. Posted on September 26, 2015 Leave a comment on Fall Drinks! Living in Texas only means one thing, MEXICAN FOOD! There is no doubt about the fact that us Texas folk love some good old Tex Mex chips, salsa, guacamole, and of course chipotle bowls! I have created a new recipe that will satisfy your Mexican cravings, that will prevent the a food coma! 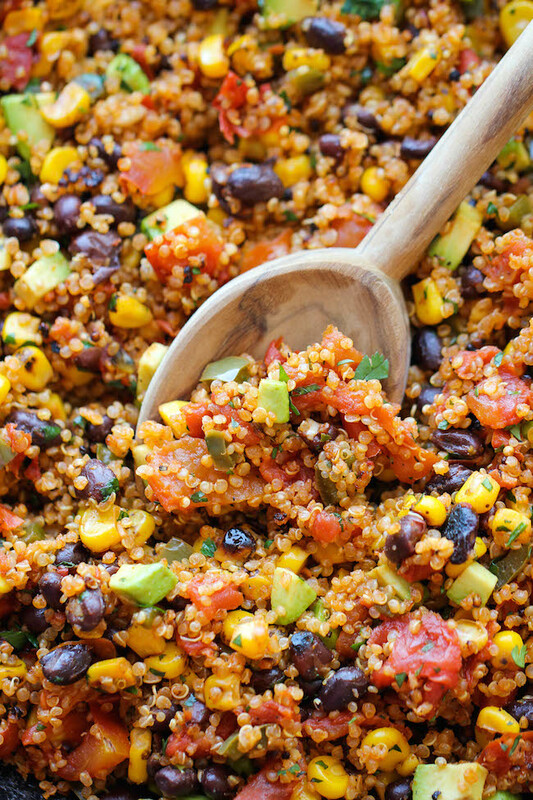 Directions, after cooking the quinoa, place all ingredients in a pan and heat for 5-10 minutes. Pour into bowls and top with salsa, plain greek yogurt, and guacamole (use my recipe). If you are wanting a burrito, get an Ezekiel tortilla and fill with the bowl ingredients! You will not be disappointed, it’s too good! Posted on September 23, 2015 Leave a comment on Modified Chipotle Bowl! My drill team girls go NUTS for these protein balls every time I make them, I wanted to repost the recipe so that you can have an easier access to make them! I have modified the recipes a little bit to make them healthier and easier to make. I hope you try them out! Mix all ingredients together and form into balls. Store in the freezer for at least 30 minutes before eating. Blend ingredients in a food processor and roll into balls. Store in the freezer for at least 30 minutes before eating. Posted on September 19, 2015 Leave a comment on Repost On Protein Balls! Bread, What’s in Your Pantry? As we all know white flour is one of the worst things and main c factor for weight gain in our bodies. However, what you might not know is that many of us are eating what we think is healthy, but is really damaging our bodies, whole wheat products! I have done research about the damage that whole wheat products do to our bodies and am eager to share them with you. However don’t worry, there is a perfect bread product to use for sandwiches, french toast, wraps and more! Whole wheat flour, what is used to make whole wheat breads, contain phytic acid that prevents essential vitamins and minerals from being absorbed into the body. It also spikes your blood sugar and insulin levels just like white flour. This whole wheat flour also raises your LDL (bad cholesterol) in your body, leading to a greater risk of heart disease! Not to mention it is high in gluten, which can cause various negative effects on the body as well. There is a bread brand that I have already mentioned with my french toast post, Ezekiel bread! This bread contains lentils, beans, wheat, barley, millet and spelt; no extra sugar, salt or preservatives! 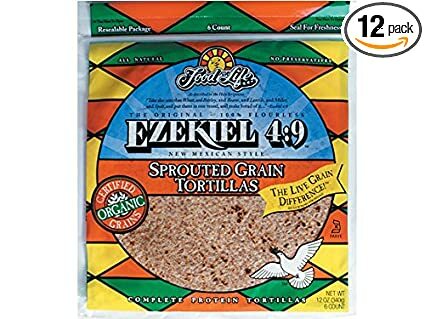 It tastes just as good as any other bread product and comes in the loaf/tortilla form, so next time you make my mexican quesadillas, use Ezekiel tortillas! I get mine from Whole Foods! Posted on September 13, 2015 Leave a comment on Bread, What’s in Your Pantry? How many of you are getting tired of the same old breakfast everyday? I know I have to change up my routine, why don’t you? This new breakfast recipe reminds me of Sunday mornings with grandma, you know what that means, FRENCH TOAST! 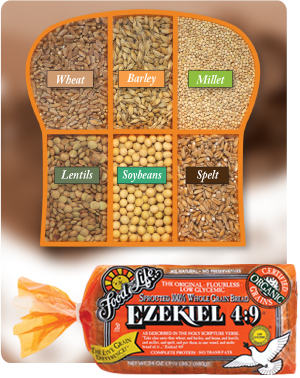 It calls for not just any type of bread, but Ezekiel bread. For those of you who have no clue what it is and where to get it, I got mine at whole foods, and it is a bread made of wheat, barley, lentils, soybeans, millet and spelt. There is actually a verse in the bible that goes along with this bread. “Take also unto thee wheat, and barley, and beans, and lentils, and millet, and spelt and put them in one vessel” Ezekiel 4:9. Even God wants you to be healthy! Posted on September 11, 2015 September 11, 2015 Leave a comment on French Toast!!! For those pizza lovers out there (I am), this one is for you! Last night I decided to make homemade pizza! I have done it once before using normal ingredients for pizza like, white flour, yeast, sugar, canned tomatoes and toppings. The pizza I made tonight had a quinoa crust topped with homemade tomato sauce, basil, veggies and feta/fresh mozzarella. I was a little nervous on how it would turn out, as pizza is my absolute favorite, but I was happily amazed! Crust Ingredients: 3/4 cup quinoa , 2 1/4 cups water, 1/2 teaspoon sea salt, 1 teaspoon baking powder. Tomato Sauce Ingredients: 2 tomatoes, 1 tbsp honey, 1/3 red onion, handful of basil, sea salt, 2 tbsp. flax seed meal. Toppings: Fresh mozzarella, reduced fat feta cheese, basil, tomatoes, onion, mushrooms and spinach. Crust Instructions: Soak the quinoa in 2 cup of water for 4-8 hours. Preheat oven to 425 degrees. Drain the quinoa. Pour into food processor with the rest of the ingredients, and blend until considerably smooth. Line a cake pan with sprayed wax paper. Pour mixture evenly into the dish. Bake for 15 minutes. While baking make tomato sauce. Take crust off of wax paper and flip to other side. Bake for another 5-10 minutes. Get toppings ready and add them on. Bake until cheese is melted. Tomato Sauce Directions: In a food processor, blend the ingredients (not flaxseed meal) until consistency you prefer. Pour into a pan on stove and heat. Add flaxseed meal. Add to pizza. I have a new recipe for granola that is my new “go to snack”, breakfast and energy booster. Many of us resort to store bought granola, I was guilty of this too. However, after some research I found that there are a lot of preservatives, processed sugars/carbs and sodium in store bought granola, including Bear Naked. This recipe takes about 5 minutes to whip up! It has a great “fall” taste because of the cinnamon but also comforts your sweet tooth with honey and dried fruit! Chia seeds and nuts are the protein/good fat sources in this recipe, that’ll keeps you full longer and boost your energy! Combine all in a bowl then place in a container, with a lid. You can store in the freezer to make it crunchy or leave in the pantry.